EMV will soon be the standard physical-world payment method in the U.S., and NFC will be part of the next evolution. Boston, September 15, 2016 – The path to full adoption of EMV as the standard for card-based physical-world payments in the U.S. has been fraught with challenges, and even 12 months prior to the October 2015 liability shift, many merchants had still not heard of EMV. The adoption of EMV has since accelerated, and the outlook appears to be anecdotally encouraging. 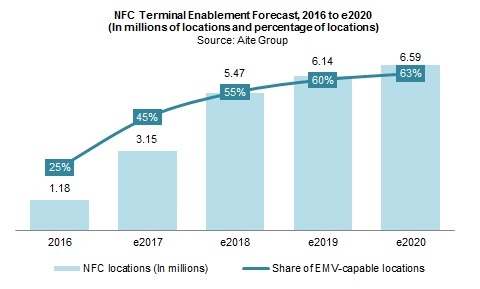 But quantitative data is needed to fully understand the dynamics of the shift not only for EMV but also for NFC, the enabler for mobile wallet usage at the point of sale. This report seeks to quantify the state of merchant implementation of EMV after the liability shift, analyzes implementation by business size and category, and explores merchant capability and interest in mobile wallet acceptance. This 26-page Impact Report contains 18 figures and three tables. Clients of Aite Group’s Retail Banking & Payments service can download this report, the corresponding charts, and the Executive Impact Deck. This report mentions Alphabet/Google, Apple, Capital One, CVS, Equinox Payments, First Data, Ingenico, Kohl’s, PAX, RBC, Samsung, Verifone, Walgreens, Walmart, and Wells Fargo.